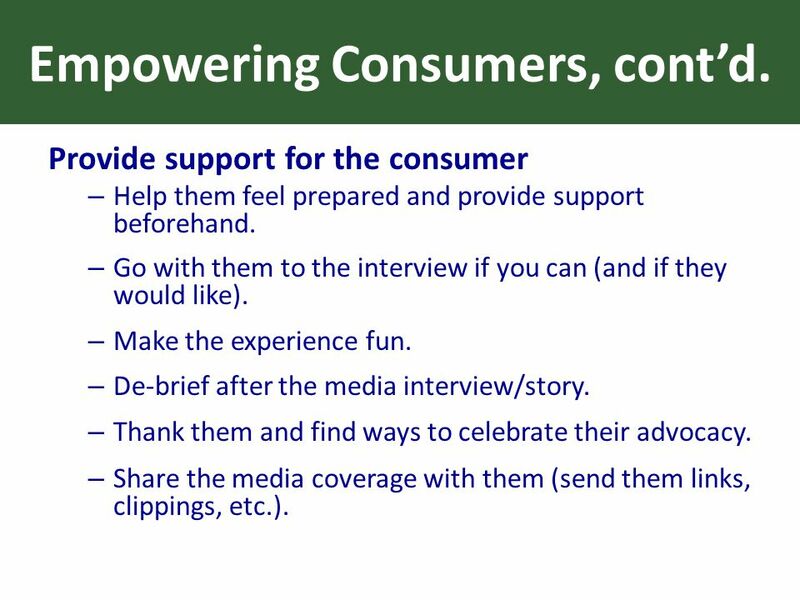 Empowering Consumers to Become Advocates Presentation by: Claudia Lennhoff, Executive Director Champaign County Health Care Consumers Families USA Conference. 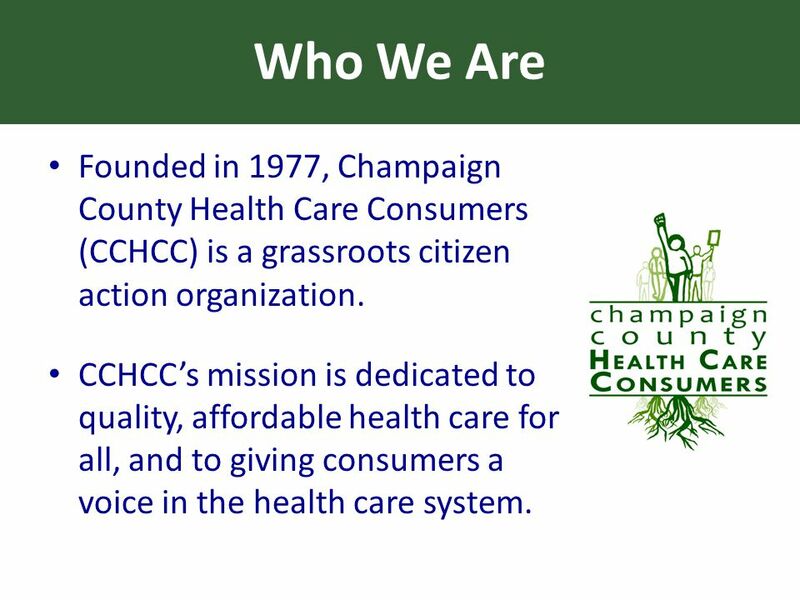 2 Who We Are Founded in 1977, Champaign County Health Care Consumers (CCHCC) is a grassroots citizen action organization. 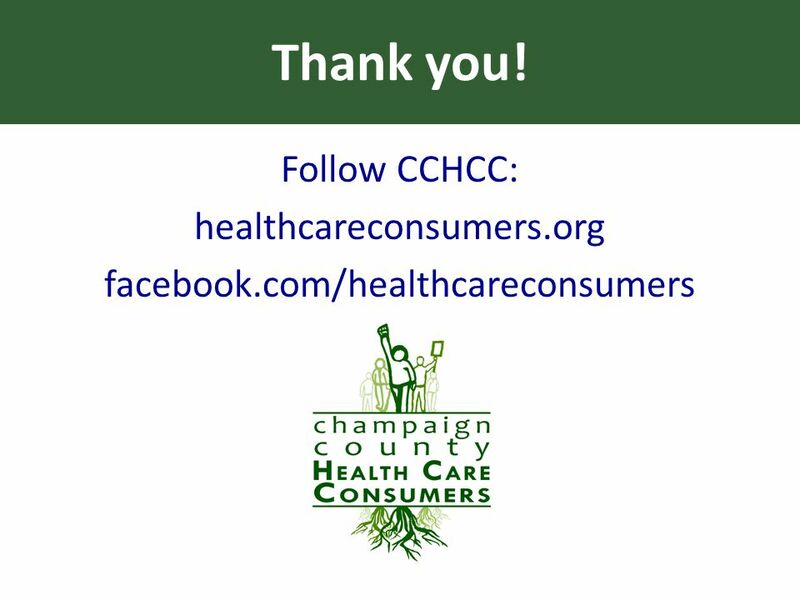 CCHCC’s mission is dedicated to quality, affordable health care for all, and to giving consumers a voice in the health care system. 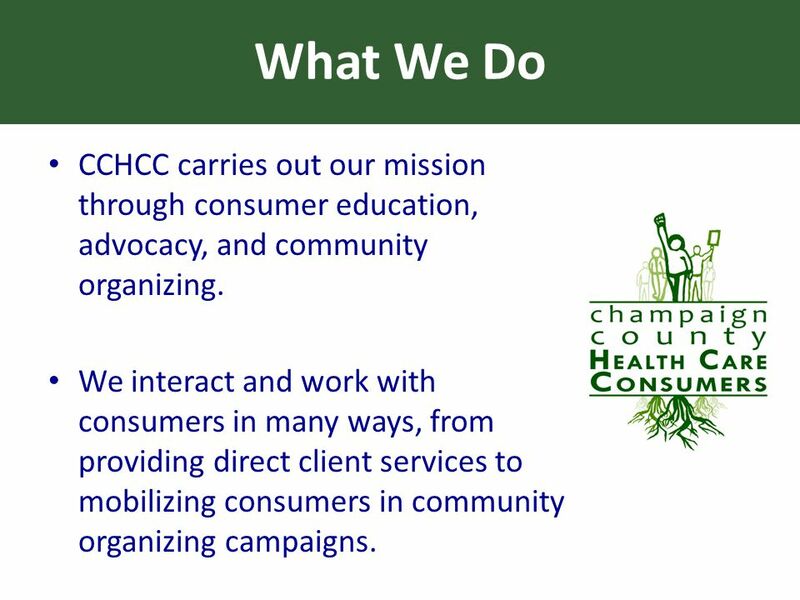 3 What We Do CCHCC carries out our mission through consumer education, advocacy, and community organizing. We interact and work with consumers in many ways, from providing direct client services to mobilizing consumers in community organizing campaigns. 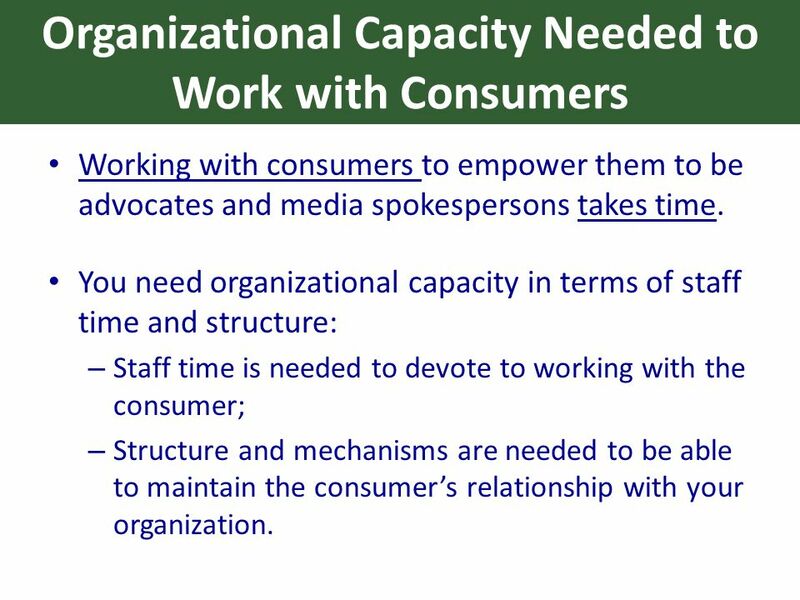 5 Organizational Capacity Needed to Work with Consumers Working with consumers to empower them to be advocates and media spokespersons takes time. 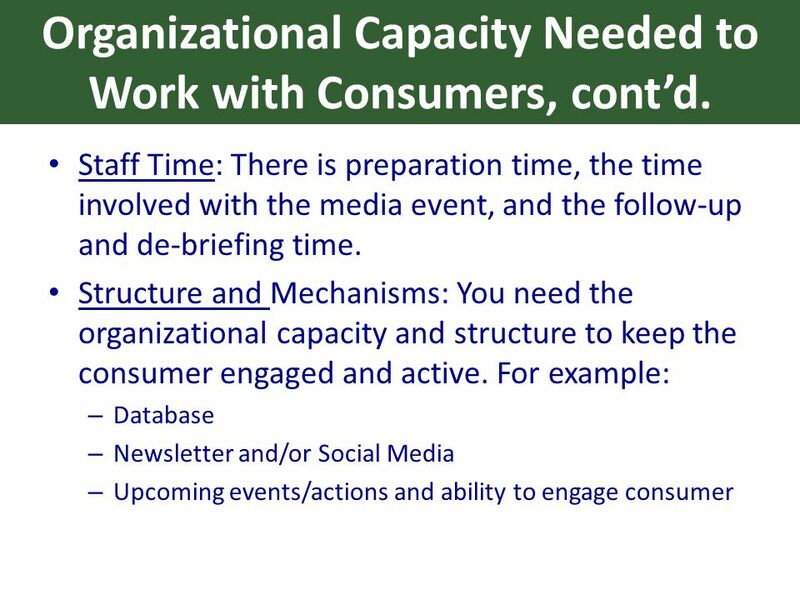 You need organizational capacity in terms of staff time and structure: – Staff time is needed to devote to working with the consumer; – Structure and mechanisms are needed to be able to maintain the consumer’s relationship with your organization. 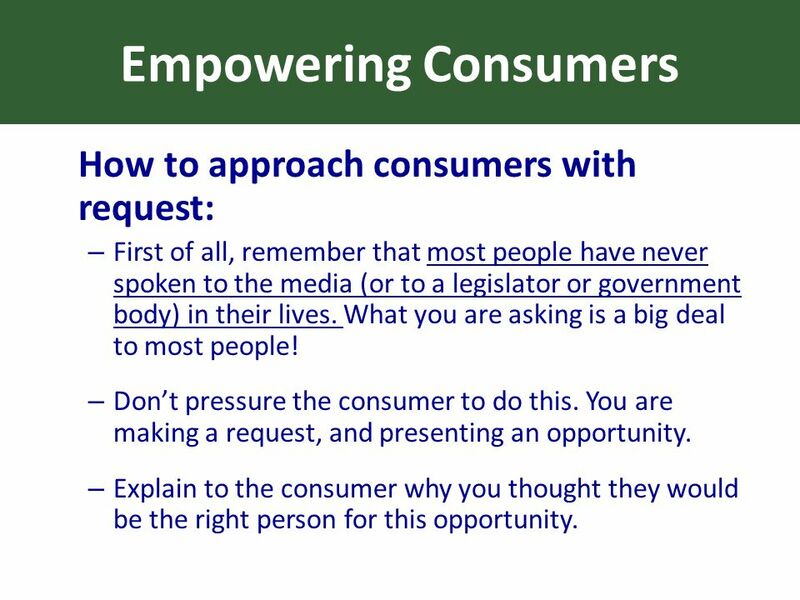 7 Empowering Consumers How to approach consumers with request: – First of all, remember that most people have never spoken to the media (or to a legislator or government body) in their lives. What you are asking is a big deal to most people! – Don’t pressure the consumer to do this. You are making a request, and presenting an opportunity. – Explain to the consumer why you thought they would be the right person for this opportunity. 8 Empowering Consumers, cont’d. Framing the request/opportunity: – Many people are experiencing the same problems. – You know that the consumer is concerned about other people. 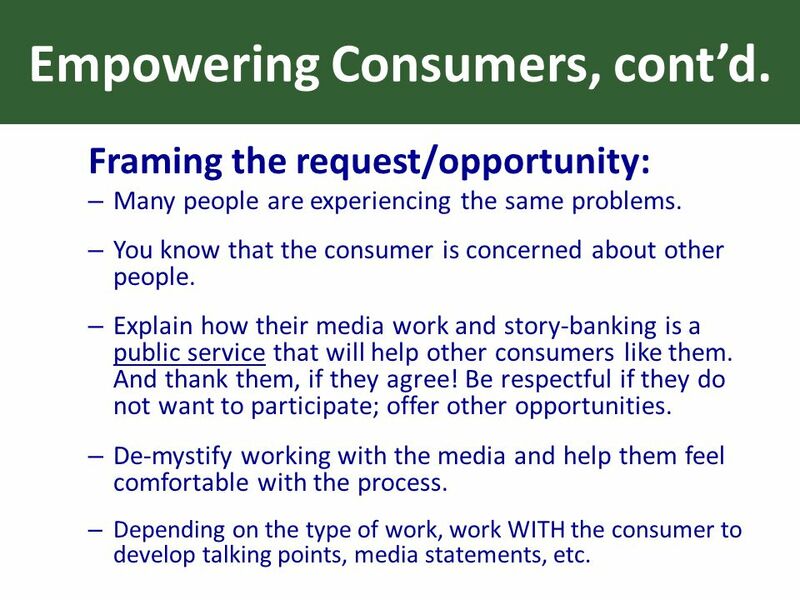 – Explain how their media work and story-banking is a public service that will help other consumers like them. And thank them, if they agree! Be respectful if they do not want to participate; offer other opportunities. – De-mystify working with the media and help them feel comfortable with the process. – Depending on the type of work, work WITH the consumer to develop talking points, media statements, etc. 9 Empowering Consumers, cont’d. 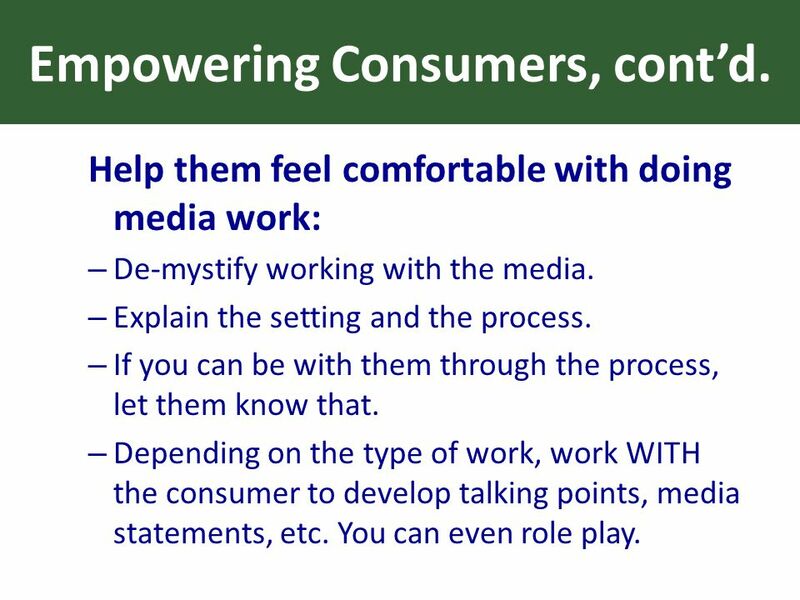 Help them feel comfortable with doing media work: – De-mystify working with the media. – Explain the setting and the process. – If you can be with them through the process, let them know that. – Depending on the type of work, work WITH the consumer to develop talking points, media statements, etc. You can even role play. 10 Empowering Consumers, cont’d. 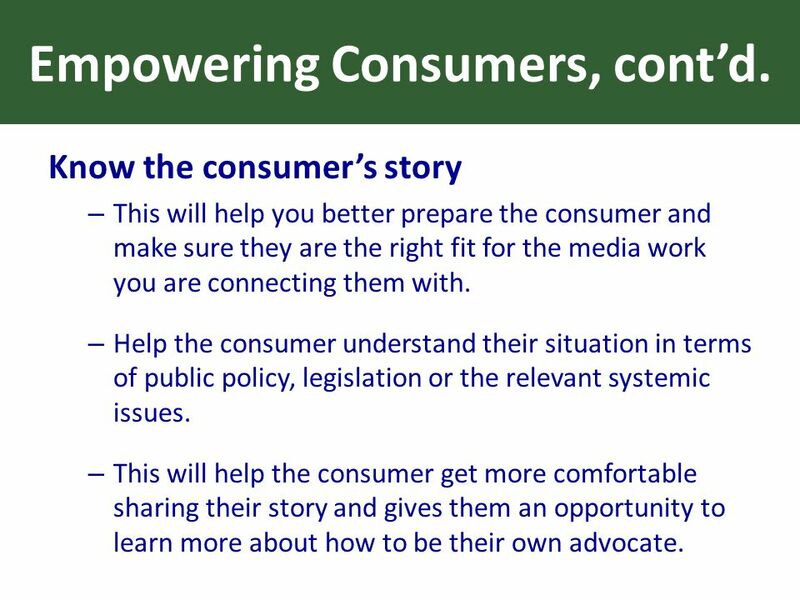 Know the consumer’s story – This will help you better prepare the consumer and make sure they are the right fit for the media work you are connecting them with. – Help the consumer understand their situation in terms of public policy, legislation or the relevant systemic issues. – This will help the consumer get more comfortable sharing their story and gives them an opportunity to learn more about how to be their own advocate. 11 Empowering Consumers, cont’d. Provide support for the consumer – Help them feel prepared and provide support beforehand. – Go with them to the interview if you can (and if they would like). – Make the experience fun. – De-brief after the media interview/story. – Thank them and find ways to celebrate their advocacy. – Share the media coverage with them (send them links, clippings, etc.). 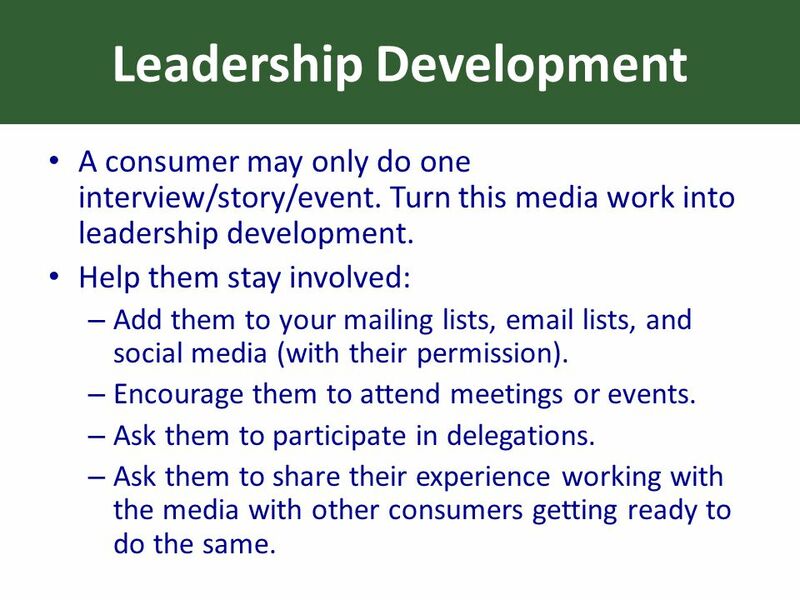 12 Leadership Development A consumer may only do one interview/story/event. Turn this media work into leadership development. Help them stay involved: – Add them to your mailing lists, email lists, and social media (with their permission). – Encourage them to attend meetings or events. – Ask them to participate in delegations. – Ask them to share their experience working with the media with other consumers getting ready to do the same. 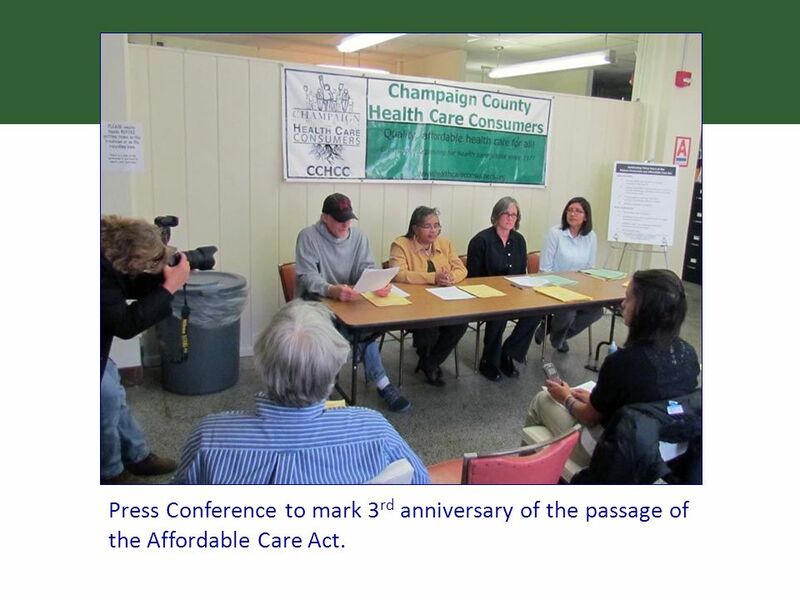 13 Press Conference to mark 3 rd anniversary of the passage of the Affordable Care Act. 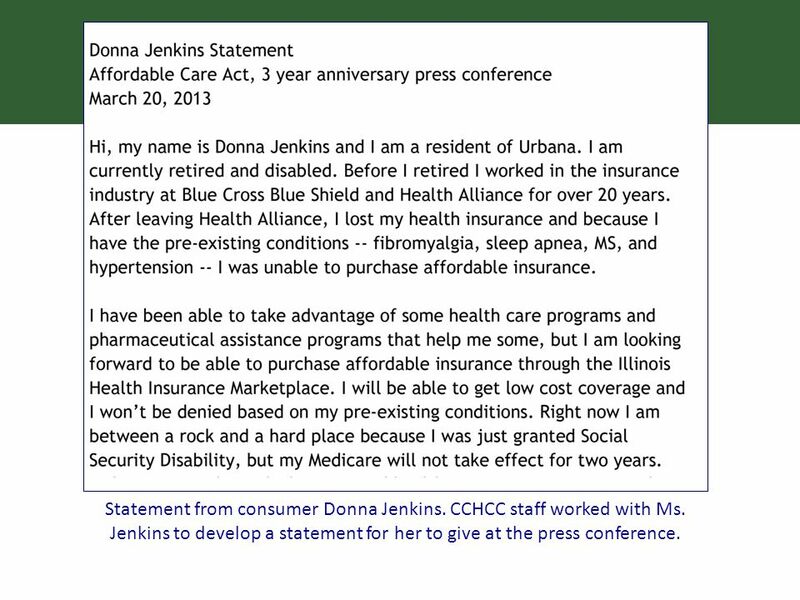 14 Statement from consumer Donna Jenkins. CCHCC staff worked with Ms. Jenkins to develop a statement for her to give at the press conference. 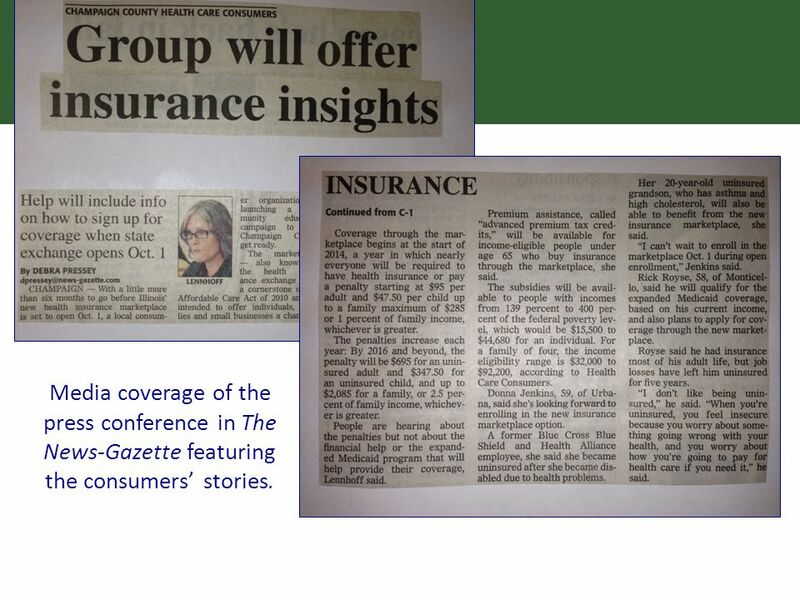 15 Media coverage of the press conference in The News-Gazette featuring the consumers’ stories. 16 Working with the Media Help the media work with consumers in a sensitive and respectful way: – Don’t put media in contact with consumer before clearing it with consumer. Explain your process to the media. – Frame consumer’s participation as public service. – Make sure media contact understands that this is sensitive to the consumer. 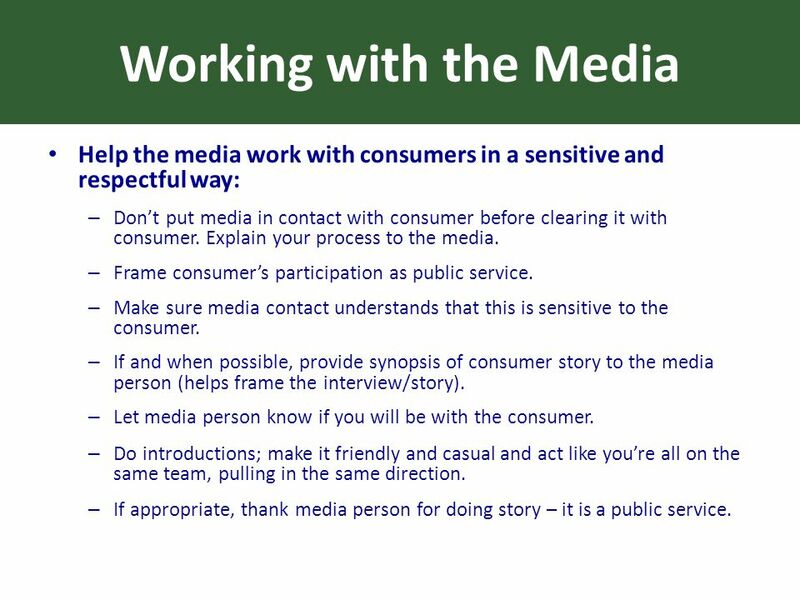 – If and when possible, provide synopsis of consumer story to the media person (helps frame the interview/story). – Let media person know if you will be with the consumer. – Do introductions; make it friendly and casual and act like you’re all on the same team, pulling in the same direction. – If appropriate, thank media person for doing story – it is a public service. 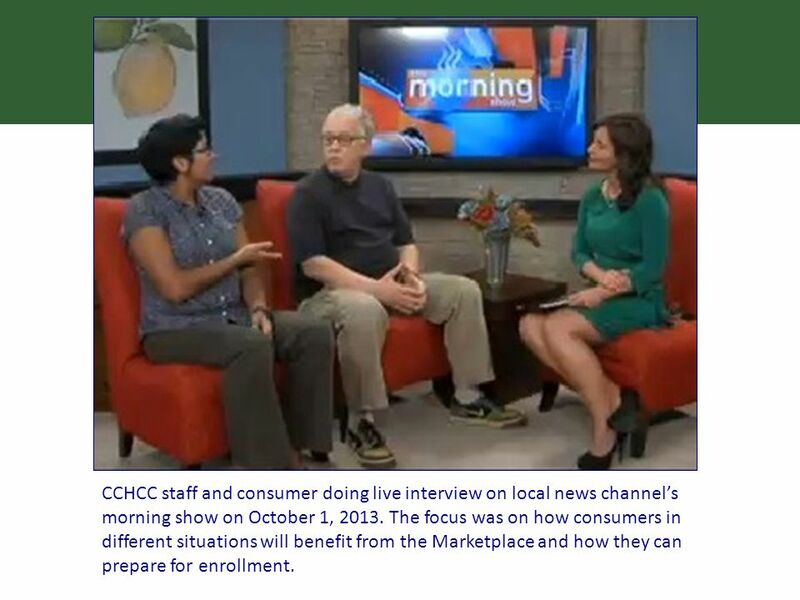 17 CCHCC staff and consumer doing live interview on local news channel’s morning show on October 1, 2013. The focus was on how consumers in different situations will benefit from the Marketplace and how they can prepare for enrollment. 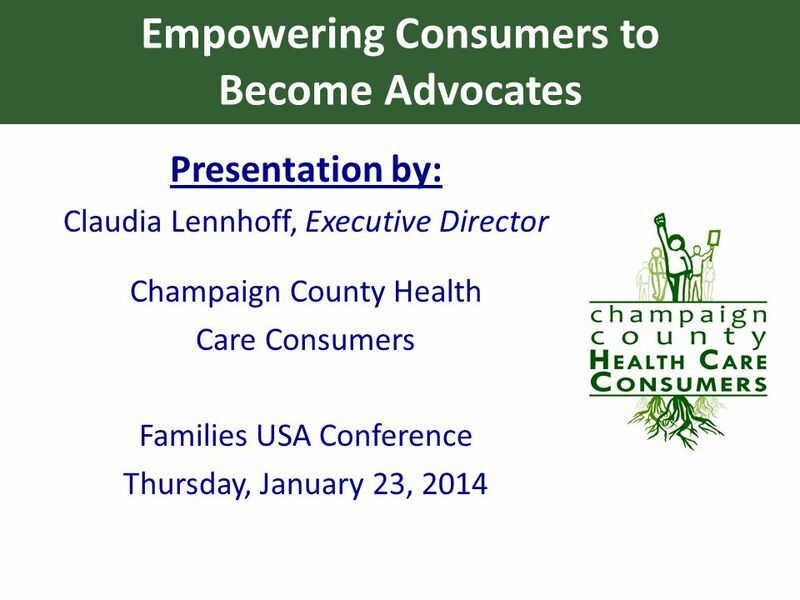 Download ppt "Empowering Consumers to Become Advocates Presentation by: Claudia Lennhoff, Executive Director Champaign County Health Care Consumers Families USA Conference." 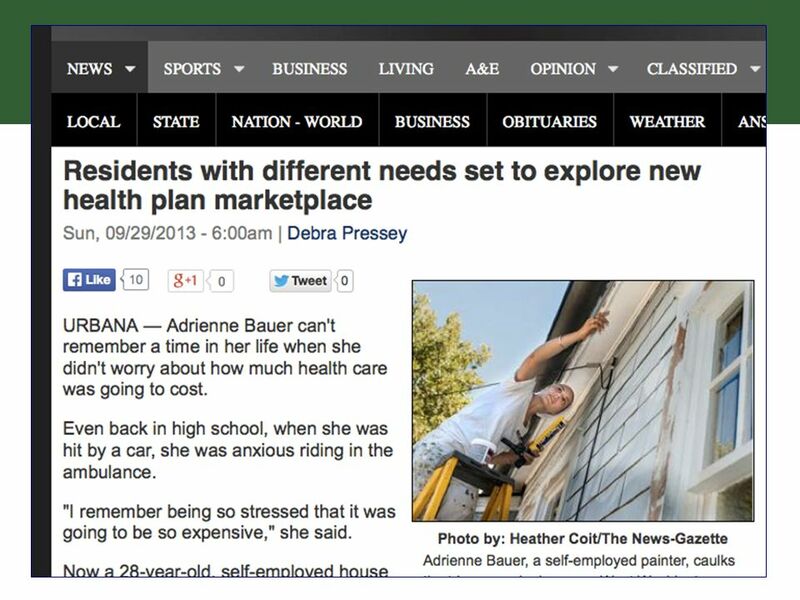 Working with the Media Getting More Media Attention For Your Chapter By: Kelly Loussedes Director of Public Relations February 8, 2006. 1 Competency-based interviews Past, demonstrated behavior is the best indicator of future performance. Club President’s Responsibilities DISTRICT 12 LEADERSHIP TRAINING. Chapter 1 The Working Director ©2013 Cengage Learning. All Rights Reserved. Solano County Office of Education Jay Speck Solano County Superintendent of Schools.